Moving a play from the page to the stage is a long, complex process. 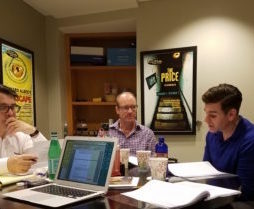 For Billy and Me, my second play, which opens at Palm Beach Dramaworks on December 8, that process, which began last year with a series of workshops led by Bill Hayes, the play’s director, has started to pick up speed. I recently signed off on the first part of the ad campaign, and a video teaser for the play was released on Friday. It features Nicholas Richberg and Tom Wahl, who’ll be playing the parts of Tennessee Williams and William Inge, the principal characters in Billy and Me, which is a fictionalized memory play about the two men’s complex and turbulent real-life friendship. If that little taste makes you curious, Billy and Me goes into rehearsal on November 7 and preview performances begin in West Palm Beach on December 6. Tickets go on sale on September 12.